As impressive as many of the features of Lion (Mac OS X 10.7) may be, the new OS is not without its flaws. And for some people, many of those flaws are little changes that, collectively, affect the overall experience of using OS X. For example, the fact that the user-level Library folder is now hidden, or that opening new windows has gained some additional—and, some feel, unnecessary—animation. The good news is that many of these little changes can be tweaked. However, while some options are available in System Preferences, many are hidden settings that require knowledge of Terminal commands or the use of a third-party utility. We’ve covered a number of Lion-tweaking commands on the Mac OS X Hints blog, but Lion Tweaks, a simple utility by 16-year-old Fredrik Wiker, gathers most of these Lion-specific modifications in a single window that lets you make changes by clicking a few buttons. Enable the 2D-Dock Starting with Leopard—not Lion—the Dock gained a 3-D appearance. Clicking Yes reverts to an OS X 10.4-like (and in my opinion, much cleaner) 2-D appearance. Remove system Windows animation When you open a new window in a Cocoa application under Lion, the window appears to “grow” from a small size to its full size. If you find this animation to be unnecessary, clicking Yes disables it. Remove Mail Window animation When you reply to an email message in Lion's version of Mail, instead of simply opening a new reply window, Mail performs some fancy window pirouettes as it creates the window. Clicking Yes eliminates these animations. Remove Reading List icon in Safari If you don’t use Safari 5.1’s new Reading List feature—for example, I prefer Instapaper—clicking Yes removes the Reading List icon (the one that looks like a pair of glasses) from Safari’s Bookmarks Bar. However, I recommend avoiding using Lion Tweaks for changing this setting, as the option is already available in the Bookmarks screen of Safari’s own preferences window—and changing it from within Safari doesn’t automatically quit Safari, as using Lion Tweaks does. Disable Spelling Correction Lion provides an iOS-like spelling checker that automatically corrects misspelled words as you type. If you find this feature annoying, clicking Yes disables it completely. Get a new Stack (Dock) List View If you’ve placed a folder in the Dock and set that folder to display its contents as a list-style Dock menu, clicking Yes here makes the list-view icons much larger—the result looks more like stack view but with icons arranged in a single column. The downside to this tweak is that you lose hierarchical menus. Highlight Stack items on mouseover If you’ve placed a folder in the Dock and set that folder to display its contents as a stack—a grid of icons—clicking Yes here makes OS X highlight whichever icon is directly under the cursor when viewing the stack. Change iCal Leather to Aluminum and Change Addressbook Leather to Aluminium These two options let you remove the overdone skeumorphism of Lion’s iCal and Address Book, replacing the leather-look window adornments with more-subdued metal-look finishes. Note that clicking Yes for either of these will launch a separate installer, as these tweaks require the utility to actually replace several files inside the iCal and Address Book applications, respectively. Use these features at your own risk, and only after making sure you’ve made a copy of the original iCal and Address Book applications in case anything goes wrong. If you later change your mind and want to go back to the stock appearance, click No, which launches a different installer to replace the original files. Disable local Time Machine Backup A neat feature of Lion is that if your Time Machine disk isn’t connected, OS X continues to perform its hourly backups, but it stores those backups on your internal drive. When you later connect your Time Machine drive, both sets of backups (those on your internal drive and those on your Time Machine drive) will be accessible from within Time Machine. While not a substitute for an external hard drive—if your internal drive stops working, you lose all your local backups—this feature is useful, for example, for recovering a file you accidentally deleted while on the road. The downside is that local Time Machine backups take up space on your hard drive—you with the 64GB SSD, pay attention—and hourly backups shorten your battery life when you’re working remotely. Clicking Yes here disables local Time Machine backups. Enable repeating keys Another iOS-like feature that debuted in Lion is easy access to special font characters by simply holding down the key for the “base” character. For example, if you want to type é, instead of having to remember the special keyboard sequence (Option-e, e) to create it, or figuring out how to use the Keyboard Viewer, you can just hold down the e key until you see the special pop-over listing all variants of the letter e; choose one to insert it immediately. This is a neat feature, but it has a consequence: If a key provides alternate versions of its base character, you can no longer "type" that character repeatedly by simply holding down its key. If you repeat characters more often than you type special characters, click Yes to disable this Lion shortcut. Show hidden files This hidden setting, which has been around since the early days of Mac OS X, forces the Finder to show all files, even those that are normally invisible. (Yes, if you enable this option, your personal Library folder is always visible, regardless of your setting for Show The User Library Folder.) Enabling or disabling this option automatically relaunches the Finder. Disable the Crash Dialog Popup Normally, when an application crashes (quits unexpectedly), you see a dialog asking if you want to send information about the crash to Apple. Clicking Yes disables this dialog so you’ll never see it again. Disable resume for a single app One of my favorite Lion features is that when you launch an application, it automatically opens any windows that were open when you last quit it. If you don’t like this behavior, you can use a Terminal command to disable it across all apps. But if you’d prefer to disable it just for particular apps, you can use this option, one time for each program you want to prevent from resuming. However, this hack isn’t quite as simple as clicking Yes. To disable resume for an app, you need to know the application’s unique ID, which is usually something like com.barebones.bbedit. The easiest way to find this ID is to open your preferences folder (~/Library/Preferences)—which is easier if you’ve used the option, above, to show your user Library folder—and then find the preferences file for the desired program. The name of that file, minus the .plist suffix, is usually the program’s ID. Enable the hidden FTP-server Prior to Lion, you could enable FTP sharing—which started OS X’s built-in FTP server—in the Sharing pane of System Preferences. That option is now gone, but the FTP server itself is not. Click Yes here to start it up. To connect to the server, you use the IP address or domain name shown in Sharing, but with ftp:// as the protocol; use your OS X account name and password to log in. However, note that FTP is not a secure form of file sharing—your account name and password are transmitted without any encryption—so I don’t recommend using FTP over the Internet unless you’re also using a virtual private network (VPN). Customize Launchpad folder background By default, folders in Launchpad have a linen-look background. If you’d prefer something different, click Yes and then choose an image (in .png format) to use for that background. Note that if changing a setting requires you to quit or relaunch an affected app, Lion Tweaks will automatically perform that action for you. So, for example, changing the Dock’s 2-D/3-D appearance automatically relaunches the Dock, and changing Mail’s window animation automatically quits Mail. To return any setting to its Lion default, click No next to that setting. If you want to return all settings to their defaults, click the Reset To Lion Default button at the bottom of the window. 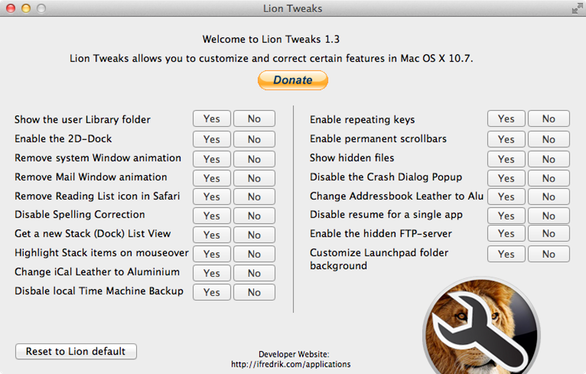 Lion Tricks is a simple way to tweak Lion to your liking.